UAE residents, 10-year-old Abdulla and his 8-year-old sister, Maymouna were diagnosed with osteogenesis imperfecta and multiple pathologic fractures. Osteogenesis deficiency is a hereditary disease that can cause multiple fractures in various parts of the body throughout a patient’s life, making it difficult for them to walk due to deformities. Since the siblings suffered from fractures more than 24 times, their parents decided to check the options abroad for specialised treatment. Their searches led them to Professor Cho Tae-Joon, at the department of orthopaedic surgery at Seoul National University Hospital (SNUH). A leading surgeon, Professor Tae-Joon was famed for treating osteogenesis deficiency disorders. The parents decided to visit South Korea in 2014 with their children and admit them for surgeries after meeting the doctor and his team. Both patients underwent successful Sofield operations on the femur and returned to the UAE the same year. Unfortunately, the siblings suffered another fracture in 2018, and the parents decided to revisit SNUH again to get them treated. Abdulla and Maymouna underwent additional Sofield operations on the tibia and were discharged without any post-operative complications. Professor Cho and his team at SNUH recently developed a new dual interlocking telescopic rod that does not just fasten but grows alongwith the bone. The pins planted to hold the bone in place also prevent it from growing in the wrong direction. “The newly developed rod is superior or similar to other devices in all aspects, including the maintenance period of the device, surgery time and length of the device, as well as reduction in complications such as bone remodeling,” according to a statement released by SNUH. When UAE national Hessa Abdallah Alshamsi was diagnosed with lymphatic cancer, the discovery majorly affected Hessa’s work-life balance, forcing her to quit her job. She visited Thailand for further tests, where she received confirmation on her condition. Hessa revealed that the UAE government also supported her to visit countries such as the US, Singapore and Korea for more tests. In Korea, Hessa underwent an operation and up to 12 cycles of chemotherapy at the Ewha Womans University Medical Centre as part of her treatment. Coming back to the UAE to recuperate, Hessa revisited the Centre later to confirm that she had been completely cured. Hessa’s biggest worry was metastasis. “I didn’t know if the cancer had spread to the breast or lymph nodes and whether it would metastasise to any of the other internal organs. Luckily, this did not occur,” she said. Hessa also revealed that she was afraid of chemotherapy and its side effects. “However, I also believed regaining one’s health was more important than worrying about the side effects,” she said. 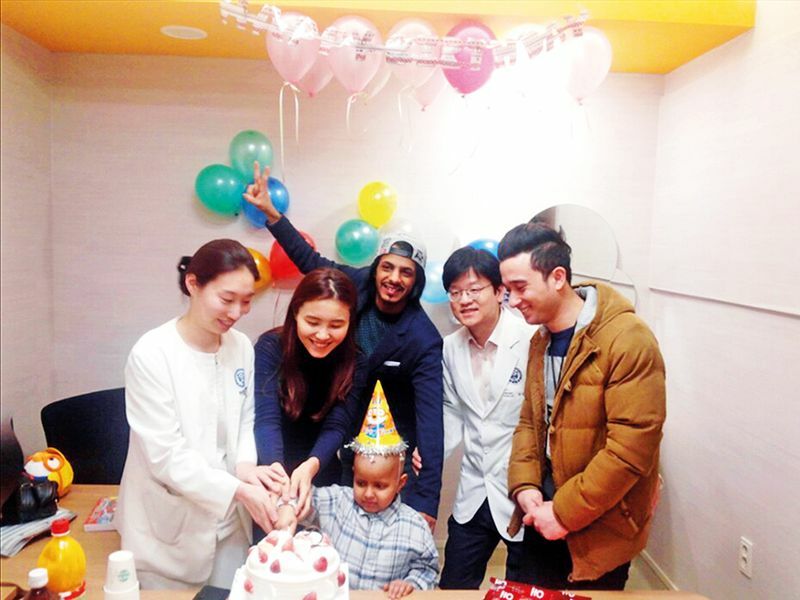 Hessa was grateful to the UAE government and the people for showing their support, as well as to her doctors, Dr Baek, Professor Paik Namsun, Professor Moon Youngchul and the interpreters who made life easier for her during her stay in Korea. “I am healed from this cancer now, but my mother died from this same disease, so I am still scared of lymphatic cancer recurrence. I am hoping it will not come back again,” she said. In February, 2015, Alhajerli Mubarak Mohammed, a seven-year-old UAE national was diagnosed with stage 4 medullablastoma, a malignant tumour of the central nervous system most commonly diagnosed in the cerebellum in children. Mohammed underwent surgery in the UAE to remove the tumour. However, an MRI of his spine and brain done later showed multiple seeding nodules on his left brain. This was when he was referred to the Severence Hospital in Korea. After examination and evaluation at the hospital in April the same year, Mohammed underwent chemotherapy sessions in the same month, which continued till November. Stem cell transplantation was also conducted on December 31 as well as on April 21 in 2016. After discharge, Mohammed was kept under outpatient observation from May to December. There has been no recurrence of the condition, since. Observation and rehabilitation, however are ongoing. Shanann Mohamed, a 30-year-old male Egyptian surgeon with multiple tumours in the liver, was among the nearly 15,000 overseas patients from 90 countries who visited AMC for treatment. Mohamed found he had five multiple hepatocellular carcinomas, including a 6-cm-sized tumour during an abdominal ultrasonography session for fatty liver. Since he enjoyed body building as a hobby, Mohamed did not wish to have a large scar on his abdomen, and decided to undergo laparoscopic surgery. However, neither the equipment nor surgeons for laparoscopic surgery were available in Egypt. While searching for a hospital, he discovered a paper on laparoscopic surgery causing fewer complications than conventional open surgery, written by Professor Kim Ki-Hun of the Division of Liver Transplantation and Hepatobiliary Surgery. He also learned that Professor Kim’s team performed the largest number of laparoscopic surgeries for hepatocellular carcinoma in the world. 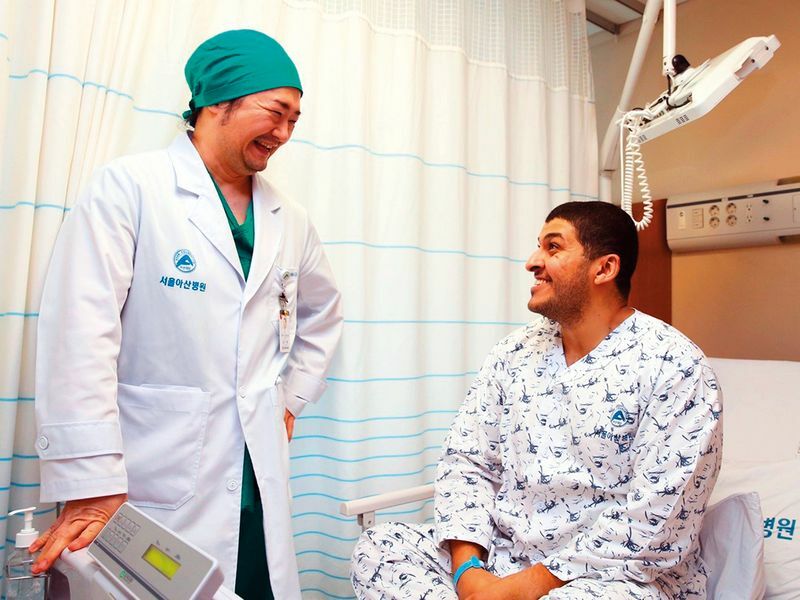 Contacting the hospital online, Mohamed got through to Professor Ki-Hun, who reviewed his medical records and examination images and answered that laparoscopic surgery was possible. After a thorough examination at AMC, Mohamed underwent a seven-hour-long laparoscopic surgery on July 4, performed by Professor Kim Ki-Hun. The surgery was successful, and multiple hepatocellular carcinomas were completely removed. On July 4, 2018, a 63-year-old female UAE national, diagnosed with severe aortic stenosis visited the hospital on a referral request from the UAE’s Zayed Military Hospital in Abu Dhabi. She deferred being operated on at another hospital and visited St Mary’s for a second opinion. Complaining of fatigue and shortness of breath even during ordinary physical activity, she was unable to walk, symptoms consistent with NYHA classification II. Her echocardiogram showed all three cusps of the aortic valve being thickened and calcified with limitation in opening. Her left ventricle was thickened and left atrium mildly enlarged. A decreased movement in base to mid inferolateral wall of left ventricle was also noted. Her echocardiograhic finding was consistent with severe aortic stenosis with mild aortic regurgitation. With an SAVR planned, the patient was admitted and underwent SAVR (ATS 18 mm) under general anesthesia. Post-surgery, she was monitored and warfarinisation was later started for her artificial valve. A post-operative echocardiogram showed normalised systolic function of left ventricle with prosthetic aortic valve functioning well. She also received rehabilitation and gait training to improve her mobility as well as cardiac rehabilitation. She was discharged on in stable condition. 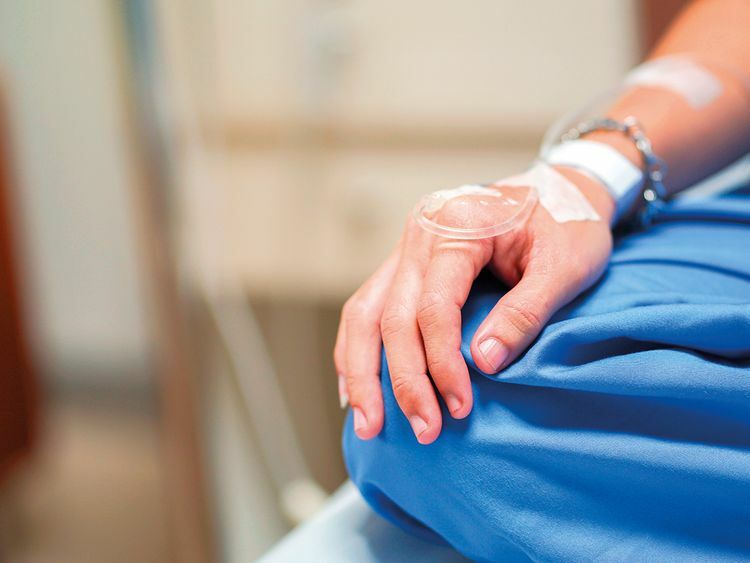 UAE resident, 38-year-old Alburushi Noora was admitted to Samsung Medical Center (SMC) as a case reference from a Dubai-based hospital after falling into a coma in May, 2016 on suffering fulminant hepatic failure (liver failure). The only way to save Alburushi was through transplant surgery, however with no eligible donors and with fulminant hepatic failure having a survival rate of just 10-25 per cent even with intensive treatment, the doctors could not afford to wait. The SMC staff, led by Professor Dong Hyun Shin of the Department of Gastroenterology, set about trying to recover the function of her damaged liver. It was a risk worth taking, with Alburushi finally opening her eyes five days after admission. A week on, with rapid improvement being registerd, Alburushi was taken off the artificial respirator. With her liver function improving, Alburushi was discharged a month later. A 14-year-old female patient from a GCC country was admitted to a major local hospital due to abdominal pain, nausea and vomiting. Ataxia, severe rapid eye movements, muscle twitching, unsteady gait and generalised weakness were also noted in the patient. Post-viral opsoclonus-myoclonus-ataxia syndrome was suspected by the team of doctors after extensive investigation with MRI, CSF studies, etc. IVIG treatments (Immunoglobuline) were given for five days without success. The patient was then transferred to SNUBH. A SNUBH pediatric neurologist performed a thorough neurologic investigation and systemic imaging studies, in addition to regular neurologic evaluation that included CT scan of the chest and abdomen. A 3X5 cystic, calcified mass was noted in right adnexa in the pelvic CT scan. The neurologists felt a correlation between the neurologic symptoms of the patient and the cystic teratoma, a rare paraneoplastic phenomenon from the teratoma, i.e. cystic teratoma related opsoclonus-myoclonus-ataxia syndrome. (Abdominal teratoma causing unusual neurologic manifestation). 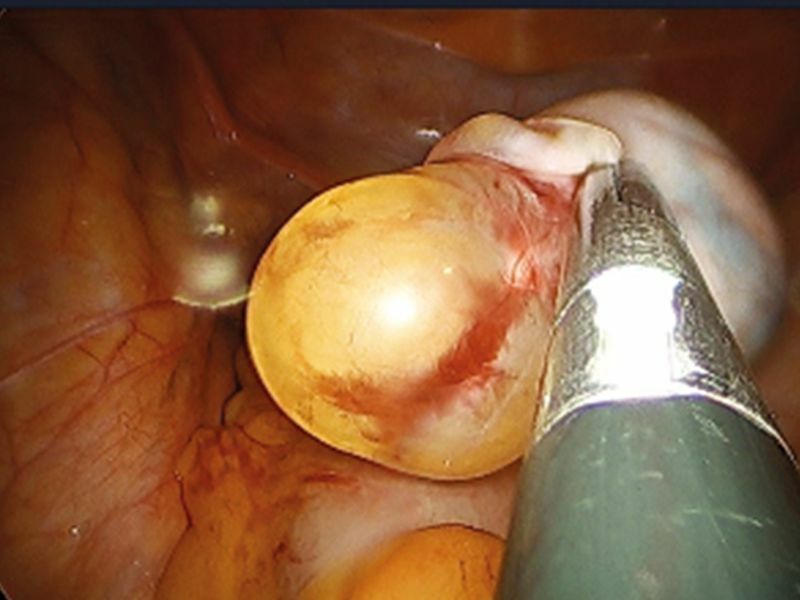 Urgent surgical excision of the tumour was recommended and the patient underwent a single port laparoscopic excision of the right adnexal cystic teratoma (a 2CM key hole surgery, see picture). Upon completion, she showed immediate improvement of all her neurologic symptoms. Post-operatively, she received a short course of steroid and IVG treatment. Within 24-48 hours, most of her neurologic symptoms such as nystagmus, myoclonus and ataxia disappeared. More than a year later, the patient is completely cured and has rejoined school. 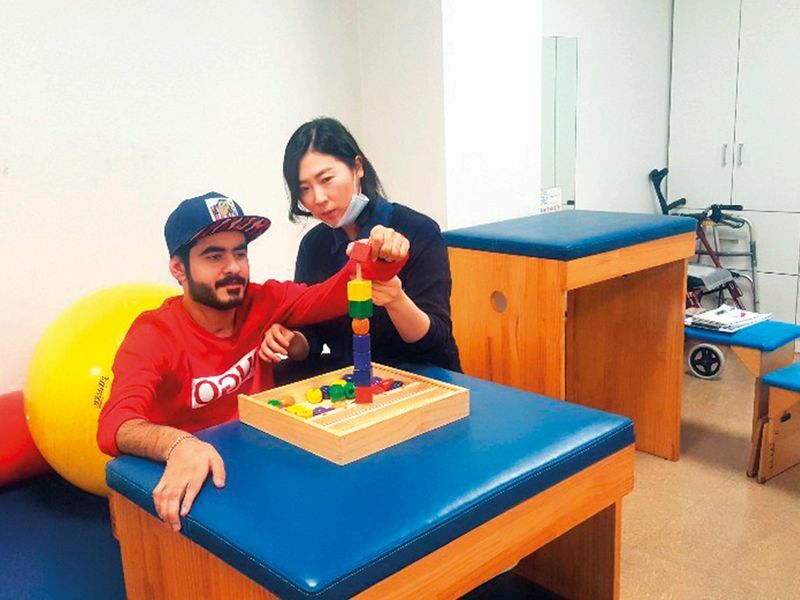 The patient, 24-year-old UAE national, Abdalla Mohamed Alharmoodi, was disabled in a car accident shortly before being discharged from the army. After receiving robotic rehabilitation treatment in Germany, Alharmoodi initially retained some functionality in his limbs. However, on returning to the UAE Alharmoodi felt his physical functioning had degraded further. He was then hospitalised at Bobath, a Korean rehabilitation hospital on August 23 last year. The patient was initially not motivated by Bobath therapy, which the therapist performed one-on-one by hand. Alharmoodi was determined to improve his condition through treatment when given the opportunity, and wished to stand up or receive walk treatment. However, both his doctor and therapist convinced Alharmoodi that practicing excessive motions without completing core strength therapy would not be the right direction to follow. Moreover, they had reinforced treatment of the upper body trunk and waist using the Bobath approach. Subsequently, after being monitored by his doctor and the staff at Bobath, Alharmoodi’s confidence grew as he participated in walking training sessions using an assist walker and a treatment device as per his doctor’s instructions. Alharmoodi thanked Bobath Hospital for understanding and treating his condition well, saying that he would learn to be treated in the future without thinking too hastily, as he now had a correct understanding of his condition. On completing his treatment, Alharmoodi was discharged on December 14.